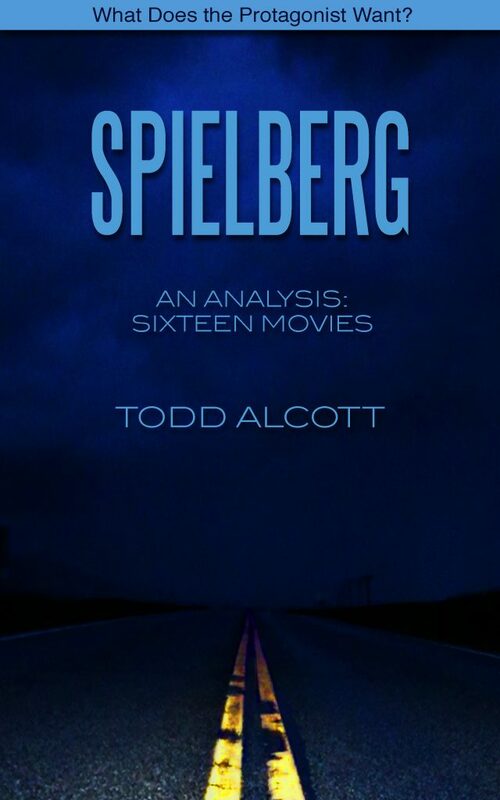 My new volume of analysis, the double-sized, sixteen-movie volume on the films of Steven Spielberg, is now available for humans with eyeballs to read at Amazon. Amazing at it sounds, Spielberg remains one of the most misunderstood, and underrated, directors of our time. If you’ve ever dismissed Spielberg, or thought “What’s the big deal?” or hated him for his whatever you hate him for, this volume will shed new light on his work. And if you’ve always liked his work but didn’t know why, this book will also shed new light on his work. And if you’ve always loved his work, this book will still shed new light on his work. Guaranteed. Tintin and Haddock are at an impasse. Tintin has lost the scrolls and his story, which means, to him, his identity — he is his story. Haddock has lost his ship — again — and thus his connection to his family. Tintin, despondent, is ready to give up, but Haddock bucks him up with what he intends to be a big inspirational speech on the nature of failure. Haddock succeeds, but not in the way he intended — instead, his truncated inspirational speech gives Tintin a practical idea, to track Sakharine by radio. Spielberg builds up a sentimental moment, then sweeps away the sentiment with a nuts-and-bolts answer — Tintin is not about introspection but action. Tintin, obsessed now, steers the plane carrying himself, his dog, Haddock and two bad guys into a storm Haddock calls “that wall of death,” leading to the first of Tintin‘s definitive set pieces, an action beat involving the plane, the storm, a boy pilot, a drunk, a bottle of medicinal alcohol, a sudden desert, a supercharged belch, a crash, an ill-timed parachute and a deadly propeller blade. Definitive because it would have been unstageable in any convincing way outside of 3D computer animation. The entirety of Tintin is gorgeous, but it’s sequences like this (and, to a lesser extent, the chase through the streets with Snowy after Tintin in the crate) where the movie comes into its own. Note as well that the “wall of death” sequence is rooted in character (“We can’t go back” and “I can’t stop drinking”) and, as in any true action sequence, it changes the direction of the story while it’s happening. Tintin and Haddock go into the storm as an obsessed boy and an unwilling coward, but the sequence ends with Tintin awakening Haddock’s courage and Haddock and Snowy rescuing Tintin from certain death — the first time anyone in the movie has shown a lick of responsibility toward anyone else. The principals go into the sequence as a boy, a man and a dog, but the emerge from it a family, that most sacred of institutions in the Spielberg ethos. This is a classic mid-movie pivot, not quite an act break, where the plot takes stock of itself and chaos begins to settle into manageable plot. Again, because the movie is meant to welcome youngsters, the mystery is clever but not difficult to solve or even keep track of. Clues are announced and always lead to correct deductions, and if they don’t (as in the case of “Karboudjan“, which was spelt out by the dying Dawes but led to no deductions at all) the plot steps forward to render deduction unnecessary. The pivot here is that the movie begins to become about Haddock. It’s not that it’s no longer about Tintin, because Tintin is still the journalist chasing the story, it’s that Tintin’s goal now becomes “to learn the story of Haddock.” He’s now chasing a story about a story, in the same way that Spielberg is making a movie about chasing a story about a boy chasing a story within a story. Tintin is captured by some roughnecks and brought to, not the Unicorn but another ship, a modern ship, the Karaboudjan. I was kind of hoping that “Karaboudjan” was an Armenian word for “unicorn” or some other mythological creature, but alas no, it is merely a darkly romantic nonsense word meant to evoke Mideastern intrigue. Since our protagonist has been shoved into a crate for his journey to the Karaboudjan, Spielberg temporarily shifts the narrative’s focus to Tintin’s avatar Snowy, who, in another physical-comedy-laden chase scene, follows the crate to the docks and thence on board the ship. Tintin is placed in a cage in the ship’s hold and interrogated by Sakharine, who apparently has hired this vessel. Again, Sakharine and Tintin almost see eye to eye, the boy adventurer and the grown-up obsessive. Sakharine has one scroll (from his own Unicorn model), Tintin has lost his (to the pickpocket), Sakharine now needs Tintin (his younger self) to find a third scroll. Sakharine is Hook to Tintin’s Peter, two sides to the same coin, or the same person on different sides of the hill. The boy who seeks adventure will eventually become a desperate, grasping pirate — unless he never grows up, which is, of course, the secret to Tintin’s enduring popularity: Tintin doesn’t age, doesn’t develop, doesn’t seek out romantic love or family or property. He is always a boy, without responsibility, not even to his dog. He’s without parents, without a childhood even, he seems to have simply emerged into his world as a fully-formed prepubescent asexual teenager, old enough to drive or pilot a plane or shoot a gun, but not old enough to yearn toward permanence. No wonder Spielberg was drawn to him, at his heart Spielberg has always been most comfortable in the role of the 15-year-old boy. He moved past his boyish obsessions and went on to create fully mature works like Schindler’s List and Munich, but you can sense his glee in being able to retreat back into the wholly imaginary world of Tintin: he’s Peter Pan without the tragedy. Tintin comes home from the library, the temple where stories go, like magic idols, to lie dormant until someone can open their secrets again, to find that someone has stolen his model ship. To you or me, that might be the end of it — “Well, it was probably that creepy Sakharine guy,” we’d say, “Jesus, it’s a good thing I wasn’t here, he must be pretty desperate.” But Tintin, as we’ve seen, lives for adventure, even if it’s a boy’s-adventure sort of adventure. That is to say, this kind of adventure, we all know, comes only from certain kinds of books, a literary genre, The Hardy Boys for instance. The character of Tintin is a callback to the past, not a real past but an imaginary past. There was never a time when there really were 15-year-old boys trotting the globe, solving mysteries and writing about their adventures. Sherlock Holmes was based on a real guy, James Bond sprung from a specific geo-political climate, Indiana Jones battles people in a more-or-less historical context, but Tintin is pure fantasy, has always been pure fantasy, and was created as part of a continuum of pure fantasy. Which is another way of saying that Tintin isn’t about a guy, there is no “there” there in Tintin, his vagueness lets the viewer fill him in, Tintin is about stories, and what they mean to us, certainly what they mean to Spielberg. Tintin seeks adventure stories to will his life into being, just as Spielberg did. Tintin has his Unicorn, Spielberg had his shark and his aliens and his Holy Grail. But I digress. Tintin, his model ship stolen, heads to Marlinspike Hall, a creepy old manse out in the country. Tintin is a writer. Spielberg wants us to remember that — the first thing he shows us in Tintin’s apartment is his typewriter collection. That seems like a really odd choice; Spielberg doesn’t show Tintin’s collection of rare artifacts or model vehicles, Tintin’s main obsession is writing instruments. And we are reminded that Tintin is not just living adventures, he’s writing them as well. Hence the typewriter in the title sequence. One could say Tintin is writing his own life, and, in pursuit of adventure stories to write, writing his life into existence. Maybe that’s why Tintin exists in such a vague space of time and place — like a lot of young men, he exists in a world of his own mind, one without political realities or, for that matter, women and their complications. The opening titles of The Adventures of Tintin, while not technically part of the screenplay, offer a jaunty, tongue-in-cheek symposium on the action-adventure genre. Or, that is to say, on the films of Steven Spielberg. There’s a boy, he’s got a companion, in this case a dog, and there is danger and bad guys and all manner of vehicular transport, often in competition with each other, and a magical object, in this case a glowing ball, that everyone is after. This describes the plots of any number of Spielberg movies. If you wanted, you could expand the titles of Tintin into its own feature, and in fact just describing them would constitute a terrific pitch in most rooms in Hollywood. What is the glowing ball? The glowing ball is, of course, the maguffin, the thing around which the action revolves. For Spielberg, that might be the Ark of the Covenant, the Holy Grail, Devil’s Tower, Private Ryan or an enamelware factory. The point of the maguffin is that it doesn’t matter what it is, it only matters that it’s important to everyone in the story. It could literally be a glowing ball and it would still have the same effect, if exploited properly. At the end of the Tintin titles, it turns out that the glowing ball is the dot to the “i” in “Spielberg,” which adds the personal touch and brings home the fact that the sequence is, in large part, autobiographical — the chase for the maguffin, whatever it is, is the guiding principle of Spielberg’s life, the glow in his eye, or the light of his “I.” That the drama of the titles plays out on a typewriter instead of, say, a drawing board, or an editing table, brings that glowing “I” to the writer’s desk, that is, to the screenplay, where a movie always begins, where it must begin. It’s often been said that Spielberg makes movies about movies, here he acknowledges that openly.